Plant Groupings: Plant slow to mature plants with quick to mature plants (i.e. leeks with spinach). Plant seedling indoors in paper egg cartons, then cut apart the individual compartments and put the entire thing in the ground. If the weather is still chilly after May 27th, protect seedlings with gallon jugs or two liter bottles with the bottom cut off. Mulch after the plants are established. There are many sources for locally-produced compost in Fort Collins. If you like the ease of a store bought compost, steer manure at your local nursery or garden store is a good choice and only costs about $1.50 per bag. Check for earthworms. Dig a hole (after it warms up) 1 foot wide, 10 inches deep, and count the earthworms in the your soil. Anything less than ten worms and you'll need to add some additional worms. You can pick them up anywhere they sell live fish bait. Put a small amount of compost into each hole you dig for each plant. After plants are established you can feed them with a compost tea. Fill a five gallon bucket half way with compost then fill with water. Let this mixture sit for 24 hours. Strain the water and feed plants with the strained water. 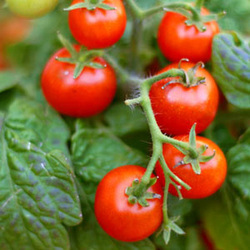 Never feed herbs and do not feed vegetables right before harvesting them. Planting garlic, marigolds, and daisy-like flowers will keep pests away naturally. Mint, dill, parsley, and fennel will also keep pests away naturally. Plant after 4:00 p.m. or on an overcast day. Feed and spray for pests in the evening or on an overcast day. Water in the early morning and early evening. Slow deep watering is best. You can can make poor man's drip system with gallon jugs.